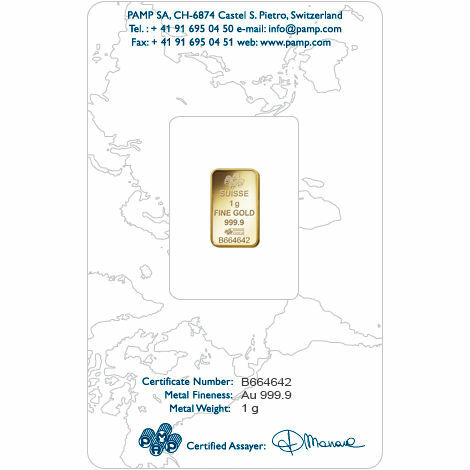 1 gram PAMP Suisse Gold Bars from JM Bullion are in brand new condition, still sealed with assay. We inspect each item we purchase for authenticity and purity, ensuring that these 1g Gold Bars are 100% authentic. If you have any questions about the 1 gram PAMP bars, please call us at 800-276-6508 or contact us via our contact page or live chat and we will gladly assist you. Contains 1 Grams (.0321 oz) of .9999 pure gold. 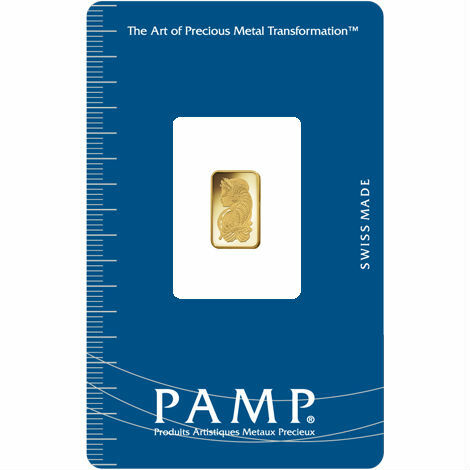 Our 1 Gram New PAMP Gold Bars present exceptional display value. Encased in blue packaging, the reverse of each case includes a guarantee as to the product’s purity. These 1 gram gold bars will be shipped in their original, sealed condition. One gram gold bars are one of the most widely traded forms of gold on the open market. They serve as a viable solution to gold investment for both small buyers and larger buyers alike. Many investors who are unfamiliar with gold feel that it would be too expensive for them to make a purchase, but 1 gram bars make buying gold possible for just about anyone. The small size of 1 gram gold bars is one of its most attractive features. 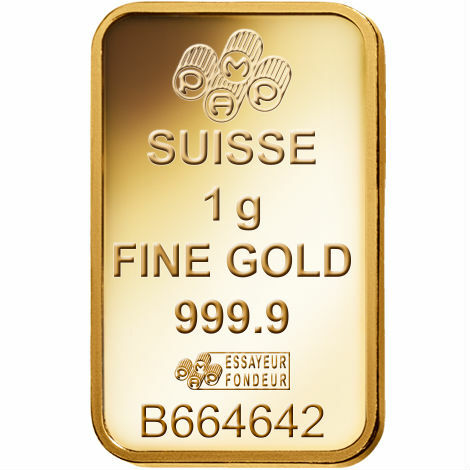 It is incredibly easy to buy and sell 1 gram gold bars for a number of different reasons. First, a gram of gold is small enough that almost any dealer or company will be able to buy it from you should you decide to sell. Also, one gram bars are available from almost any gold retailer, providing individual investors with a virtually limitless supply to build their portfolio. The primary reason why 1 gram bars are in such demand is found in its comparable cost. It is no secret that 1 ounce bars and even 10 gram bars are quite expensive. 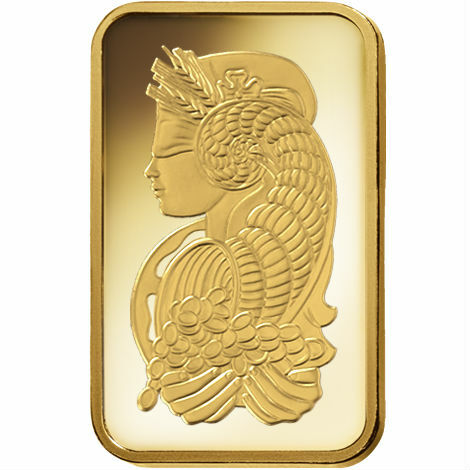 Whether you are new to gold bullion or simply want to make a smaller sized initial investment, 1 gram bars will meet your needs. This isnt to say that these bars arent a sound idea for larger buyers too, however. There is a lot of merit in diversifying the types of gold that you own, creating little difference between several 1 gram bars or a small quantity of larger bars. One gram bars truly are a solution for just about every type of gold buyer. For more information on 1 Gram PAMP bars, contact us at any time.
" This is a stunning little bar and the assay packaging is solid." " Just received my 1g bar and I must say what a beautiful lil piece of gold. Very satisfied with the delivery and my Gold. Oh ya, and it was delivered just two days after the order! Another Great service JMB!" " Stating to buy gold each month. I look forward to purchase more each month." " Recived two of these (1 gram). It may seem small to some people but I really like how any one can afford there own." " I love these PAMP bars, I know they arn't cheap, but i dont think there's any cheap fractional assey gold around. My bars shipped fast so i couldn't be happier." "This is a stunning little bar and the assay packaging is solid." "Just received my 1g bar and I must say what a beautiful lil piece of gold. Very satisfied with the delivery and my Gold. Oh ya, and it was delivered just two days after the order! Another Great service JMB!" "Stating to buy gold each month. I look forward to purchase more each month." "Recived two of these (1 gram). It may seem small to some people but I really like how any one can afford there own." "I love these PAMP bars, I know they arn't cheap, but i dont think there's any cheap fractional assey gold around. My bars shipped fast so i couldn't be happier."